Freight + Volume is pleased to present Through Every Leaf, a two-person conversation featuring the works of JJ Manford and Max Razdow. 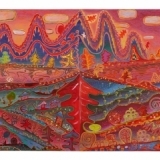 Manford and Razdow create paintings and works on paper that embrace the mystical and phantasmagorical. 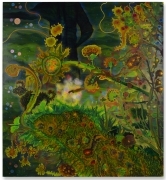 Reminiscent of English transcendentalists such as William Blake and Samuel Palmer, and more recently American symbolists Charles Burchfield and Arthur Dove, their work is steeped in nature and focuses on creating hallucinogenic narratives with roots in surrealism, magical realism, and symbolism. Both share a similar experience of growing up in New England where they were influenced by the same landscape, from the solitude of Walden Pond to the breathtaking shoreline of Martha’s Vineyard. Their artistic identity is rooted in a rejection of the conservative norms of their times. Manford and Razdow portray an active imagination and the need to reveal more, feel more, taste more, hear more, and explore more. They create narratives out of ageless amazement, attunement to nature, and the simple curiosity and pleasure of stargazing. 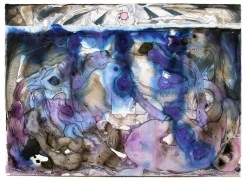 In unique ways, each artist constructs a landscape from a personal vision. Manford sees himself as one of his subjects. 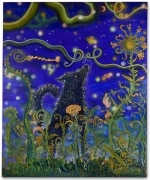 His paintings describe psychedelic, biomorphic plants, and avatar-like figures of dogs and butterflies. The subjects are placeholders, signposts on a journey, and provide a way for Manford to explore solitude and his inner-cosmology. He uses paint to understand what we are, who we are, where we are, and what we are doing. Razdow’s works on paper place the human presence against the immutable sea and horizon. He creates a mystical backdrop upon which his characters perform - a space indefinable, in limbo, without orientation. 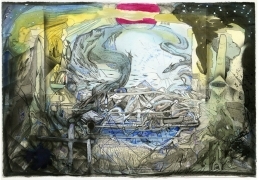 His epic, mural-sized work on paper titled The Rift, for example, is 30 feet long and 6’9” feet high, and presents figures moving “against time” in a right-to-left progression. Passing from childhood to old age, they are depicted as crossing the threshold of the ocean rift, into hermetic space, and then emptiness. Manford places us in a landscape at once liquid and phosphorescent. It is foreign, familiar, trippy and intoxicating. He asks us: what is it like to exist as a butterfly, what is the reality of a dog, how does a plant survive? He asks us to open our thinking, to let magic slip into our daily existence, to remember that our imaginations are powerful and need nourishment. 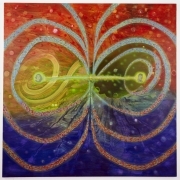 He offers us this nourishment as a portal, a beckoning to explore a world that exists for the purpose of existing. Razdow conveys the narrative of an adventure at sea, past the shoreline to where there is only water from horizon to horizon. It is here that definition gets slippery. What exists in the depths of the ocean? 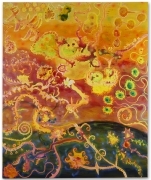 His paintings take on the quest to commune with a giant salmon, a sea nymph, a sea-monster, as well as to drink in glorious sunsets. He asks us to join him and to boldly travel beyond the concrete rules of reality. Razdow’s stories wrap us up in the past, present, and future all at once. He shows us that this life is anything but linear. The work brings us to a place where we can reflect on life, and ponder where we are and who we are. As viewers we are thrown, tossed, and pulled between the two parallel worlds created by Manford and Razdow. 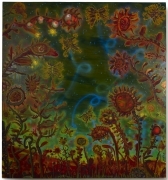 Manford’s painting Deep Field depicts a boy and a girl suspended in the middle of the painting but on opposite sides of the canvas. They are linked and tangled up in a cosmic dance. The painting questions karma, the notion of soul mates, the pathways we take in life, and the people we encounter. Razdow’s series De Vermis in Se (The Worms in Themselves) are imagined eel-like denizens of the abyssal ocean found lurking on the ocean floor. These sea serpents manifest as personifications of the unknowable; they are a corpus of the primordial unseen. This work questions: what exists at the edges of things? What do we discover when we go a little bit farther? What is there waiting for us in the outer depths of our imagination? Manford and Razdow approach art as a way to push the boundaries of what is considered possible – and magical. This joint exhibition highlights their similar yet stylistically different approaches to storytelling. They create a seductive environment where we are able to tap into and enjoy our imagination. They ask us to take a moment away from the hustle and bustle, the grind of everyday existence, and to let our minds wander a bit. They ask us to calm our anxieties and stress and to simply exist. Like young shamans, these artists challenge us to step out of our skin and to look at the world differently. They allow us to suspend ordinary disbelief and enter into other worlds that they have constructed. They also want us to trust them, and to follow them on this expedition into the unknown. Freight+Volume invites the public to join these artists and embark on this great adventure together. Max Razdow was born in Boston in 1978. 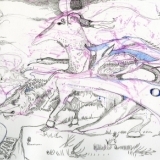 Recent solo exhibitions include Future Myths of the Surface (2011) and We Wait as Banshees Wait (2010) at Galerie Jan Dhaese in Ghent, Belgium, and Dusk Drawings (2012) at Trailer Park Project, San Juan, Puerto Rico, and The Double Dirty Dozen & Friends (2012) at Freight+Volume, among many other exhibitions in the U.S. and internationally. Razdow's work has been discussed in the New York Times, Art Fag City, and L Magazine. Razdow received his MFA from New York University in 2008 and a BFA from the University of Wisconsin-Madison. He lives and works in New York. Born in 1983, JJ Manford is an artist living and working in Brooklyn. He received his undergraduate degree from Cornell University, in 2006, and his MFA from Hunter College in 2013. 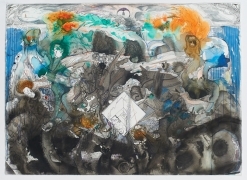 He has exhibited in Chicago, New York, Philadelphia, London, and recently had a solo show, entitled "The Brink of Utterance", at John Davis Gallery in Hudson, NY., and a group exhibition at Sardine Gallery in Brooklyn, NY curated by Jon Lutz. JJ is also a co-founder of the Brooklyn based artist collective Underdonk, and has organized projects independently, which have been featured in Hyperallergic & Two Coats of Paint. Most recently, he lead a critique as a MFASO visiting artist at Hunter College, NY. He currently teaches painting at Time-In/Hi-Art! in Chelsea. Please join us on Thursday, July 17th to celebrate Manford’s and Razdow’s first two-person exhibition at Freight+Volume, Through Every Leaf, from 6-9pm. Refreshments and mind-altering art will be served. For more information, or to schedule a preview, please contact Nick Lawrence at 212-691-7700, or nick@freightandvolume.com.